Every now and then I have to go through the fridge and try to think of inventive ways to use the food. One day I made a mixture of corn, black beans, onion, green pepper and tomatoes. To my great consternation, David called it succotash. That started a heated discussion (argument) about the definition of Succotash. As much as it pains me to admit it, turns out David was right. 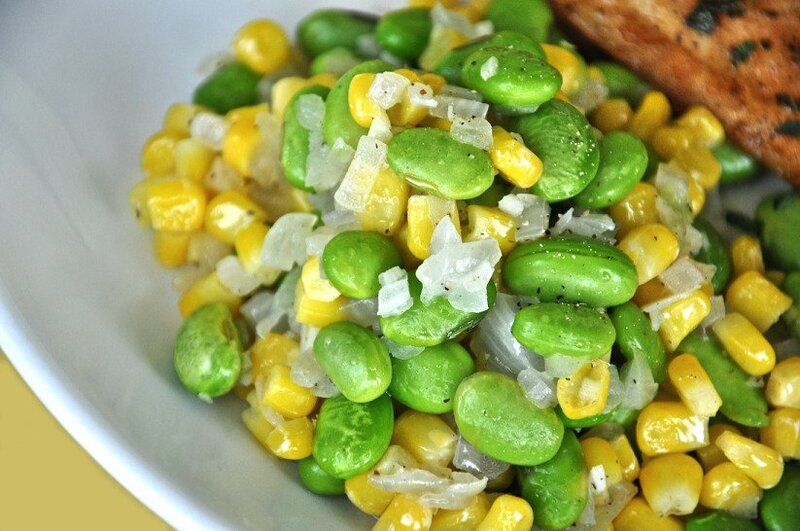 Succotash is a truly American dish. The name actually comes from the Narragansett Indian word msakwitash meaning fragments or boiled corn. In the earliest form it was simply a way to use corn and beans before they sprouted. If there was any meat available, it was chopped up and thrown in the mix. Over the years succotash has evolved and what you call succotash will depend on where you come from. No matter what you beans you use or what you add to it, the basic ingredient is corn combined with a bean of some sort. The bean sorts include lima, green, kidney, black and even soybeans. Common additives are salt pork, butter, cream and sugar. Vegetable choices include tomatoes, onions, green pepper, squash, spinach, greens and mushrooms. I have seen recipes that use green peas instead of beans (shudder!) If you are a Southerner you might think that succotash includes okra. And there are some people who swear the sunflower seeds are the way to go. No matter how you think about it, there are a few things that guaranteed to make it more tasty. They include: onions, garlic (lots of it), mirepoix and peppers (mild and/or hot). To my everlasting surprise, succotash has become a “go to” meal in our house. It is easy to throw together and is hot, filing and ever so satisfying. Probably because it contains a complete complement of proteins. The thing to remember when you make succotash is 1:1:2. As in 1 part corn, 1 part beans and 2 parts veggies. My basic approach is to clean out the fridge and add whatever I have. This is a great chance to experiment with combinations of veggies and herbs to see what works for you. This is not a precise recipe. I have NEVER in my life (until I decided to try and write it down) measured it, I just eyeball it. While some batches are better than others, I have to say I have never made one that is inedible. Serve with a small salad. This entry was posted in Beans, entrée, Protein, vegan, vegetarian, Whole Food Plant-Based Food Kitchen, Whole Food Plant-Based recipes and tagged complete protein dish, corn, food, Native American cuisine, Soul food, Succotash. Bookmark the permalink.